For example, the latest Panasonic VRF solutions can be less obtrusive in the long term and during the installation process. There is no need for ducts in the ceiling and installation can have little impact on the day to day activities and operation of a building. Furthermore, the units can be controlled remotely via a mobile device or PC to help monitor energy efficiency and avoid costly bills. Split systems for smaller areas can be installed that only require a refrigerant and power line to connect them and thus alleviating the need for moving walls and ceilings and taking up less much needed space. When specifying a VRF system, appropriate system-sizing will ensure optimum performance. Oversizing will result in an inefficient system which also affects humidity levels – critical in making the space feel cooler. In addition, a system should have accurate load calculations and be correctly optimised for the space required to ensure energy efficiency. Regular maintenance of a system can help deliver the longevity and efficiency of a system such as removing dirt and debris from the units and regular checks on the pipe work. In the past, a lack of pipe length has caused issues for installations but now, with today’s systems capable of operating with extended piping lengths as standard (pipe runs are possible up to 100m with many Panasonic VRF units), this problem is not now an issue. 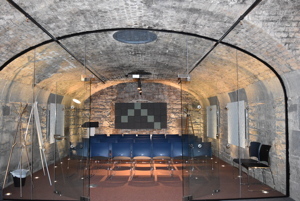 A great example of an installation in an historic property is the listed CHQ Vaults in Dublin. The unusual architecture and historical importance of the vaults presented some interesting challenges for this installation, which were overcome thanks to the flexibility of the system. 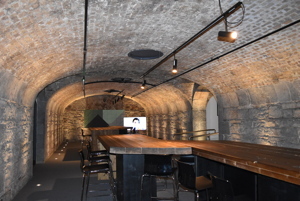 The CHQ Vaults, situated in Dublin’s historical docklands, were originally used to store tobacco and whiskey in the 1800’s. Many years later, during the 2000’s, the building was refitted to accommodate retail units, when the space became a shopping haven. Now, in its most recent transformation, the vaults have regenerated into a commercial hub of offices, restaurants and bars. The client, Dogpatch Labs, wanted to create an innovative, tech co-working space utilising a 13,500ft² area within the vaults. The interior design incorporated original features within the space for an eclectic working environment. When it came to heating and cooling, they called in specialist air conditioning and ventilation experts Crystal Air to install a system that would both work with the structure of the building and effectively ventilate this old, underground space. The vaulted brickwork structure of the building combined with its listed status meant that Crystal Air already had several challenges to overcome. Firstly, the air conditioning system had to be easily removable in case future tenants wanted to fit an alternative solution. Secondly, none of the installation work could damage the bricks and mortar of the original vaults, and nothing could be attached to the historical vaulted ceiling. The system also had to provide consistent cool, clean air in a large office space of over 150 desks, to counteract the underground atmosphere.